If Chinese traditional genres were likened to siblings, then Cantonese music would perhaps be the youngest most adventurous one. Developed in the 1920s and 30s in the southern coastal province of Guangdong, this syncretic traditional combines elements of Cantonese opera melody and mode with Western harmonies. Cantonese ensembles include a mix of Western and traditional Chinese instruments. Some commonly used Chinese instruments include the gaohu (a two-stringed fiddle), dizi (tranverse bamboo flute), yangqin (the hammered dulcimer), ruan (round plucked lute), qinqin (a scalloped plucked lute), sanxian (fretless long-necked plucked lute) and various small percussion instruments such as chimes, clappers and woodblocks. Western instruments include the saxophone, cello, violin, and electric guitar. Cantonese pieces are known to be short and programmatic. Titles of pieces such as Pinghu Qiuyue “Autumn Moon on the Still Lake” describe settings in nature that convey a serene or light-hearted mood. Cantonese music as a category has also come to include several distinct sub-genres such as Chaozhou and Hakka music, both of which have a significant solo repertoire for the zheng (zither). Yueyun Elite is dedicated to perform Cantonese instrumental and vocal music. Founder and leader Hoi Seng Ieong is a famous Cantonese opera performer, with 56 years of experiences. 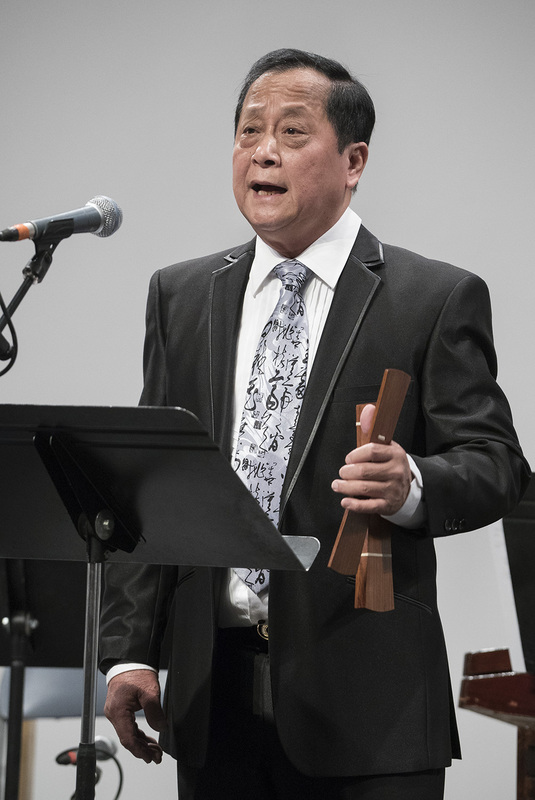 Also an important mentor in Vancouver’s Cantonese music community, he plays gaohu, violin, and other instruments in Cantonese ensemble and opera music. The other members of the ensemble have all grown up in families of many generations of Cantonese musicians, in addition to their formal training from the China Xinghai Conservatory of Music. The first Chinese immigrants to Vancouver were from Canton (Guangdong); therefore, their musical activities at the time reflected their background. Between 1916 to 1941, a number of Cantonese opera troupes toured in North America and made stops in Vancouver. In 1930s, Jin Wah Sing Cantonese Music Society (振華聲) and Ching Won (清韻) were formed in Vancouver Chinatown. They are the longest running Cantonese opera houses in Vancouver, only interrupted briefly during the China/Japan war. In the 1950s, Cantonese opera houses and clubs were again thriving in Chinatown. The most famous ones were Jin Wah Sing 振華聲, Ching Won 清韻, Ngai Lum Music Societies 藝林音樂社。Many men working in the factories and small business in Chinatown participated at these music clubs after working hours. They learned the music from each other and found comfort in this closed community only known to the Chinese immigrants. In 1961, Jin Wah Sing invited professional musician Wong Toa from Hong Kong as the opera house’s new artistic director. Wong became the most influential master of Cantonese music in Vancouver for the next 30 years. In the 1980s, a huge wave of immigrants from Hong Kong came to Canada. Unlike the early Chinese immigrants, constituted of low-income working class, these new immigrants arrived with better education and English language capability. Many of the men maintained businesses in Asia and traveled back and forth frequently. Their wives with the extra wealth and time were able to develop their interests in singing Cantonese opera. The opera houses became ideal community centres for social gatherings. As a result, many musicians were able to make a living by playing and teaching Cantonese opera. Many new Cantonese opera houses have been established. They are no longer concentrated in Chinatown, but branched out to Richmond, the new centre of Chinese immigrants.